It’s one of those days when your schedule is more jammed than a breadbasket full of croissants. Or maybe you’ve arrived on a morning flight at Vancouver International Airport (perhaps with a connecting flight to catch later) and your stomach is growling louder than the airplane’s engines. There are many good reasons to dive into a hearty breakfast. Luckily, Richmond has a full menu of egg-cellent early morning options to consider. Loosen your belt, start salivating and sate your appetite at our top seven recommendations for the city’s best early morning (we&apos;re talking 6:00am-ish) breakfast spots. 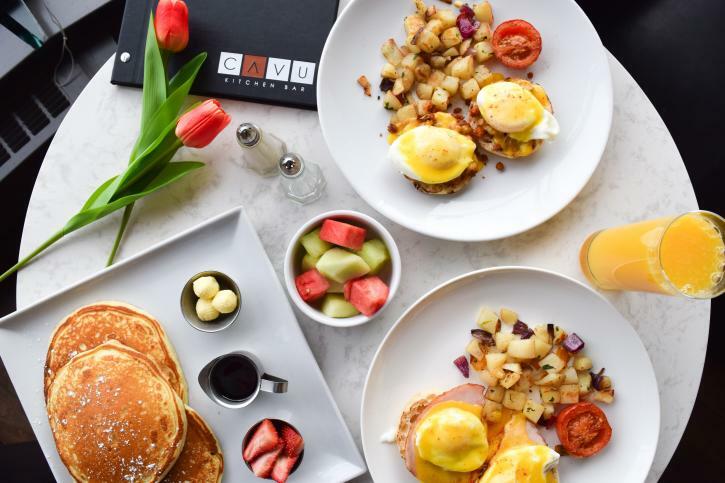 Popular with locals and visitors alike, this Vancouver Airport Marriott Hotel restaurant has ever-friendly servers and a wide array of elevated breakfast classics, from buttermilk pancakes to steak and eggs. Consider the banana pecan French toast or the satisfying ‘broken yolk sandwich,’ made with bacon, cheese, two eggs and sourdough toast. But if you’re hungrier than a grizzly that’s just finished hibernating, head straight for the All-Canadian Buffet, where everything from congee to sausages and cooked-to-order eggs and Belgian waffles await. With four Richmond locations, BC’s White Spot chain has been fuelling locals for decades. But they’ve never rested on their early morning laurels, reinventing their breakfast menu to combine staples like Nat’s Hearty Breakfast (served with endless shredded hash browns or home-style ‘smashbrowns’) with tempting newer options. 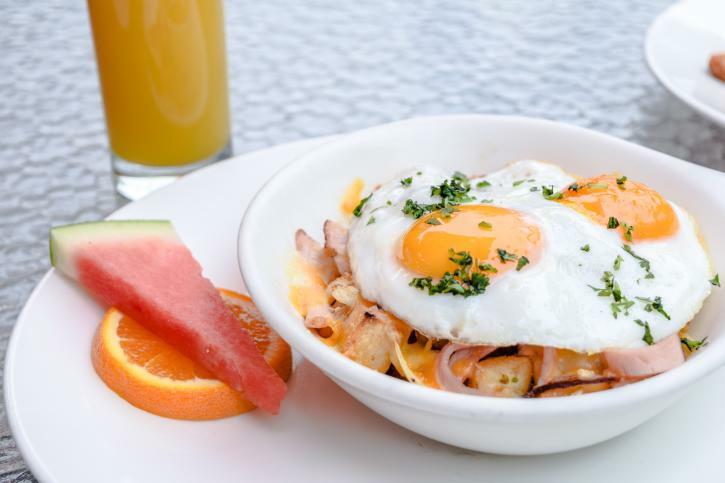 Cheesesteak hash or shrimp Florentine benedict are justifiably popular, but you can also cover all your egg-based cravings with a Nat’s Scramble dish, which comes in four tasty options (candied salmon and goat cheese recommended). The main dining room at the Sheraton Vancouver Airport Hotel is famous for its association with Harold Cross. He’s been such a loyal customer—dining here daily for more than 35 years—that they renamed the restaurant after him. Menu-wise, the Deluxe Breakfast Buffet covers every comfort food need, with chicken congee and vegetarian chow mein noodles adding to the fun. The à la carte menu includes omelettes, pulled pork hash and a skillet heaped with eggs and back bacon. 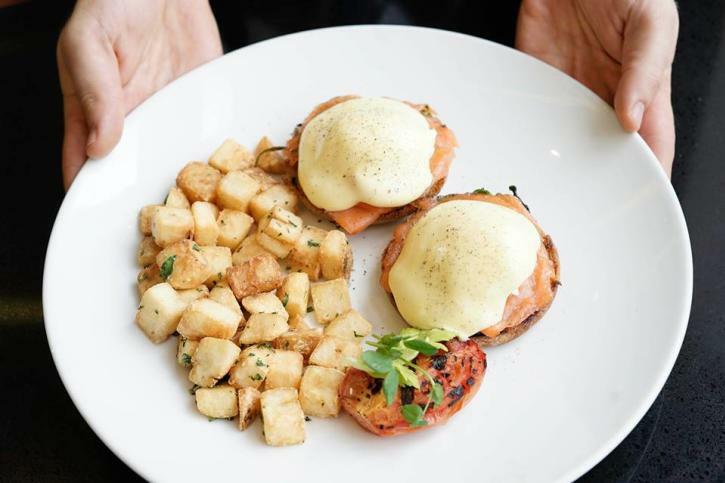 But our choice is the eggs benedict, available in ham or (for $5 more) BC salmon versions. And if you’re keen to meet Harold, stick around: he’s often here at lunchtime. Inside the Westin Wall Centre Vancouver Airport, this posh, contemporary restaurant foregoes the buffet route for a well-curated array of modern classics, including berry-topped French toast, corned beef hash with poached eggs and a $17 Miracle Breakfast that comes with eggs, potatoes and sausage, bacon or ham—plus a $1 donation to the Children’s Miracle Network charity. There’s also a good array of fresh-made juices and smoothies here. For something a little more exotic, try the dark honey spiced quinoa bowl or aim your appetite at our favourite: the delicious broccoli spinach frittata, served with perfectly-cooked fingerling potatoes. From bennys to omelettes and from breakfast BLTs to steak and eggs, pub-style Fogg n’ Suds—part of the Holiday Inn Vancouver Airport—hits all the required morning meal bases. But when you’re hungry for more, their two self-serve buffet options are among the best-value morning meals in the city. It’s just $6.95 for the continental buffet (including cereals, bagels, yogurt, fruit, and croissants) or $12.95 for the full buffet, combining all the continental options with sausage, bacon, hash browns and more. Both options include tea, coffee and juices. 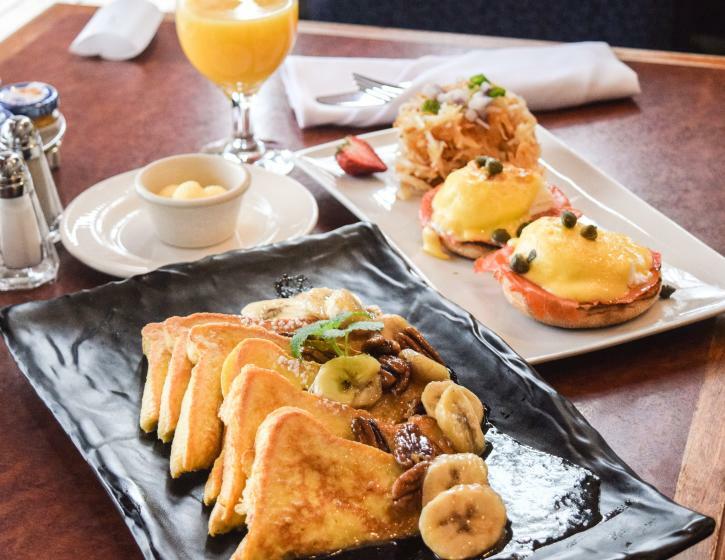 Possibly Richmond’s largest and most sumptuous breakfast buffet, this River Rock Casino Resort treat is popular with hotel guests and in-the-know locals alike. With a side dish of sterling Fraser River shoreline views, you’ll find a seemingly endless array of Western and Asian-influenced dishes to load up your plate with. Keep in mind that it can be very busy on weekends—you might have to queue—but if you’re thinking of dining a little later on a Sunday, the Sunday Brunch buffet (11:30am-2:45pm) is also an excellent option.